Designed to be worn with 2½”–4½” of ease through the hips. 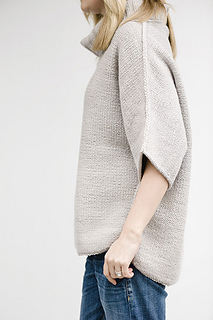 Due to the dolman-style sleeves, the bust will be very loose. Use the finished hip measurements to determine which size to make. 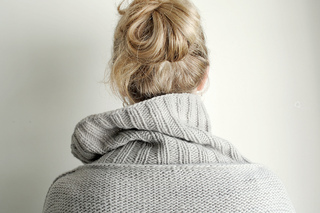 Manos del Uruguay MAXIMA (100% extra fine merino wool; approx. 100g/219 yds), 6 (7, 7, 7, 7) sk. Shown in #M2552 Foil. 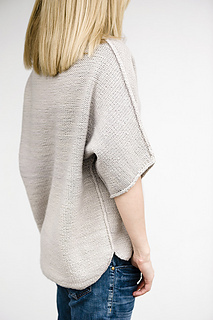 This oversized dolman pullover is worked in reverse stockinette stitch (purl stitches are on the right side) with exposed seams at the sides, sleeve bottoms, and shoulders. 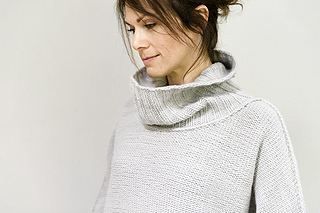 Stitches are picked up around the neckline for the cowl collar, which is knit in a loose rib stitch.